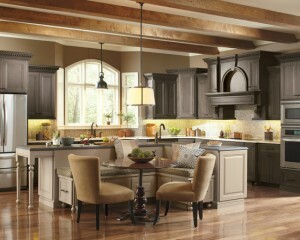 At Diamond Design Kitchen and Bath Gallery we understand that service is the key to a smooth project. From the moment you enter our fully operable 4200 square foot showroom-gallery, you’ll be able to envision your space and its unlimited possibilities. Our design consultant will meet with you and go over your needs. Then we design your space with our state-of-the-art software offering you a 3 dimensional perspective of your completed project. We can show you how each cabinet, drawer or pantry may open in the specified space and show you your selection of painted, glazed or stained cabinets in your design layout giving you a true visual rendering of your completed project. Our design consultant is available and involved every step of the way. From the start of your selection process to the completion of your on-site project, we here at Diamond Design Kitchen & Bath Gallery achieve our high standard in service by working together as a team. Whether your project is “over-the-top” or “budget minded”, our goal is your complete satisfaction. We also offer complete project management through our construction division. We’re sure you’ll find our team of professional installers, contractor, and our design consultant will provide you with the quality products you need and the impeccable service you deserve.